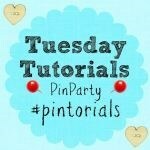 A huge welcome to Week 25 of the Tuesday Tutorials Pintorials Pin Party! It is going to be a busy week for us as both my children have finished school for the summer holiday! Six weeks of having them at home! Hopefully, we can share some of our crafts with you soon. This week I am featuring three different ways of painting. Firstly is from JDaniel4’s Mom. She has used marble to beautifully paint the zebra. I would never have thought of using marble at all! Next is Mini Monets and Mommies who turned tissue paper into water colour. That looks like so much fun! Finally, we have the gingerbread house who used cardboard rolls to make beautiful flower prints! Don’t forget to pop by to take a look at Kate (fun fruits snack), Anna (summer sensory play) and Hodge’s (c craft) blogs to see who is featured this week.